The FEI seems determined to take a blind eye on this one, falling back on the “this was a national ride so nothing to do with us – phew” excuse, despite evidence the incident did occur in a FEI ride and that the horse they say died wasn’t even there. This involves the now viral videos showing a poor grey breaking its leg and then valiantly hobbling on to keep up with the rest – who didn’t stop to help, naturally. The incident was said to have occurred during the King’s Cup fixture on March 4th, when three CEIs (international rides) and two CENs (national rides) were staged. You can read how things stood in this complicated saga by the end of May here, though lots has happened since. 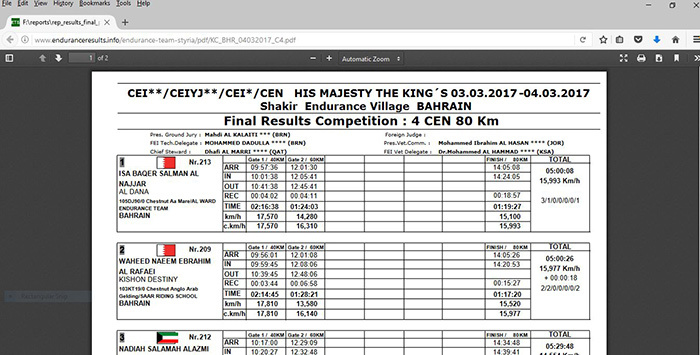 A blogger called Fair Endurance – not connected to the active “clean endurance” community in northern Europe – posted the images in early April, claiming the fatality occurred in the feature King’s Cup 120km CEI itself, but was not shown in the official results. It is the clear duty of FEI officials to ensure Catastrophic Injuries (CIs) are accurately recorded and a report filed. As it is, CI statistics are only a snapshot, for the FEI is extremely open about the fact any horse that expires soon after it has left the competition site will escape inclusion in official figures. Fair Endurance alleged that the 4* official Dr Al Hammad of Saudi Arabia had covered this up. Dr Al Hammad is among many people Fair Endurance don’t like – they are not very keen on me, either – and they have taken a pop at him before. They also claimed he failed to record previous CIs in Bahrain, where he seems to be foreign veterinary delegate a lot of the time. Well, it transpired the FEI did provisionally suspend Dr Al Hammad in April, but lifted it six days later after being told by the Bahrain national federation (NF) and Dr Al Hammad’s lawyers that the fatality occurred in the 80km CEN. Media were simultaneously told that CEN horses were on the piste at the same time as CEI (really?) which explained why the injured horse appeared in the same images as the 120km horses. The dead horse from the CEN 80km was Samba de L’Ile. No FEI rules or processes broken, then; case closed. This was surprising to the many other people from the “clean” community, who undertook their own studies after Fair Endurance’s initial allegations. European news organisation Grand Prix Replay even went to the trouble of computer-enhancing the images. By comparing detailed loop data of everyone in the numerous publicly available pictures containing the grey before and after the fracture, not to mention he bore the same colour-coded bib as everyone else in the 120km CEI, all concluded the dead horse was Qalipso de Kerbreden, owned by the Royal Endurance Team of Bahrain. Qalipso is an undisputed starter in the 120km CEI and listed as “Failed to Complete” which the sceptics interpret as “disappeared into the ether.” And precisely because Fair Endurance is widely regarded as an unreliable source, people of good repute took more time than they usually do scouring all available material, quadruple-checking the likely identity of the dead horse. The FEI’s get-out-of-jail-free card didn’t last long. Fair Endurance responded by posting a CEN start list as purportedly generated by timings provider Styria with no sign of Samba on it. Meanwhile, other people passed information to the FEI that Samba had, in fact, died months beforehand from colic. But the FEI really, really didn’t want to answer any more questions about the thoroughness of their own investigation or to share any documents that supported the Samba explanation. Unfortunately, Fair Endurance also declined to reveal their original copy of the start list, thereby supporting the FEI/Bahrain NF view that Fair Endurance were the fraudsters. Instead, having run out of ideas about what to do next (yes, hobby bloggers, investigative journalism isn’t that easy after all) Fair Endurance then beseeched me to pick up the baton, quite a turn-up given the disgraceful things they have previously said about me. The saga took a new turn a couple of weeks ago when the FEI told me that Styria had not done the timings for any Bahrain CEN this past winter season, only their CEIs; the Bahrain NF has apparently sorted the CENs themselves, curious as that sounds when a CEIs and CEN are run together. Ergo, Fair Endurance’s start list with no Samba had to be faked. Can someone explain, then, why a bunch of detailed Bahrain CEN results from its most recent winter season are archived on Styria’s website, including the CEN at issue – with no sign whatsoever of Samba? They are not on Styria’s public pages, but clearly on its server once you know where to look. Our screenshot below also has Styria’s URL clearly shown. As this blog was posted the FEI advised it was continuing to investigate why Styria had archived data we are told it didn’t collect and which included information we are assured is “fictitious.” I have also invited Styria to comment – no reply yet. The other demoralising aspect is that I and others have felt obliged to download, screen-shot and even film all this material because this sort of awkward documentation has a history of disappearing. Fair Endurance is an anonymous blogger active for the past year or so. It is believed to involve eastern Europeans with allegiances to the UAE. Most of its blogs try to draw flak elsewhere by lashing out at the UAE’s critics, at other horse sports and even at other Middle Eastern countries, notably Qatar and Bahrain. But whatever their agenda, it doesn’t mean they get all their facts wrong all of the time. It’s mostly their fault the topic keeps hitting a brick wall, though. First, Fair Endurance’s dire, self-inflicted reputation means most people treat anything they write with a pinch of salt. Secondly, in their rush to implicate Dr Al Hammad, Fair Endurance didn’t bother to identify the dead horse by name at the outset, and instead drip-fed information into the public domain over many weeks, which gave anyone so minded ample time to massage the sequence of events. Feel free to add your own hypotheses in the comments box below. Whoever’s version turns out to be correct, it all stinks.